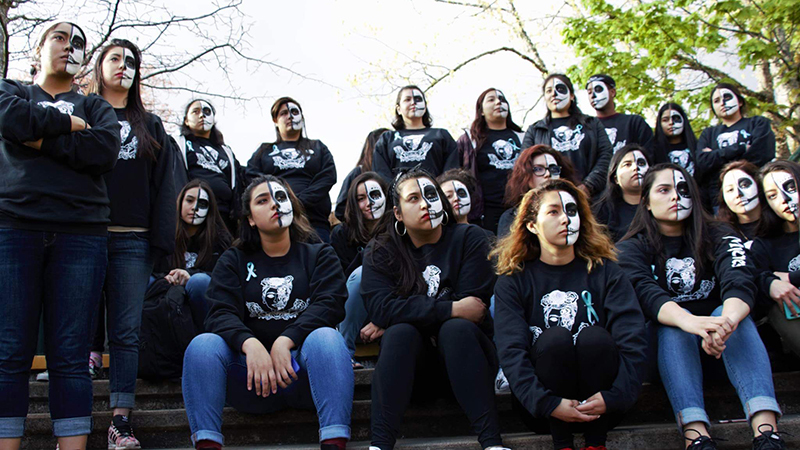 Take Back the Night, an international movement to raise awareness about the realities of sexual and domestic violence, will mark 40 years at the University of Oregon this week with a campus and community march designed to raise awareness for survivors. The 6 p.m. event on Thursday, April 26, is a chance for all survivors of sexual and domestic violence, and for those who want to demonstrate support, to gather in solidarity. 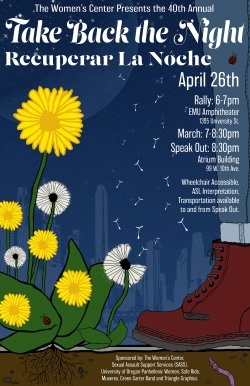 Take Back the Night began in 1976 and was first held at the UO in 1978. The march ends with a “speak-out” where survivors and allies share personal stories of how sexual and domestic violence has affected their lives. This year’s keynote speaker is a 2016 UO political science alumna Cholena “C.C.” Wright, a citizen of the Klamath Tribes from mbosaksawaas, or what is currently known as Chiloquin. She is known for her expertise in decolonial indigenous feminism, reclaiming indigenous traditions, education, and politics. She serves as the coordinator of Native American recruitment for the UO and frequently travels to indigenous communities around the U.S.
“C.C. works to live her everyday life with decolonizing/indigenizing intention and encourages those around her to play a role in dismantling colonial hetero-patriarchy and colonial gender violence and their ongoing oppressive structures, Pervaiz said. The rally will also feature speakers from UO student groups Women of Color Coalition, Muxeres, LGBTQA3, Muslim Student Association, Veterans and Family Student Association and the Sexual Wellness Advocacy Team.